If you're hankering for a wheeled amphibious vehicle with assault potential but don't want something as big as the DUKW, perhaps this custom Jeep will do. Built by the folks at the Amphibious Vehicle Design Studio, the Platypus Jeep is a paragon of on-road and in-water capabilities. 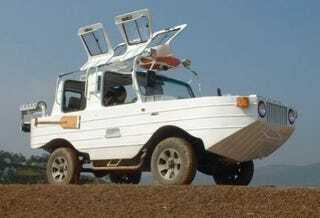 The floating four-wheeler runs with a turbo diesel engine and is capable of 110 KPH on the road and 10.5 KPH in the water. The hull is designed to work in wave heights up to 1.5 meters and bottoms with a slight 0.75 meter draft depth. We can already picture ourselves storming the beaches of Sleeping Bear Dunes. A full list of specs below, for some reason. What&apos;s Your All-Time Favorite Military Land Vehicle?